Venue: Chez Castillon, 7 Rue Victor Hugo, 33350 Castillon-la-Bataille, France – see http://www.chez-castillon.com/course/write-and-sell-short-storiesoct-2015. Cost: £875 (pounds) per person including accommodation and food. Excluding flights and transfers. Details: This practical, five day course will introduce you to the craft of writing successful short stories for competition entry and / or the women’s magazine market. Sessions will cover generating ideas, matching your style to the market, preparing for publication and how to approach an editor. Students will receive guidelines for paying markets and will aim to complete the course with a finished story which they will be helped to submit to a suitable publication. Suitable for all levels from beginner to experienced writers. Day students welcome – ask for details. Date: January 2016 (dates t.b.a.). 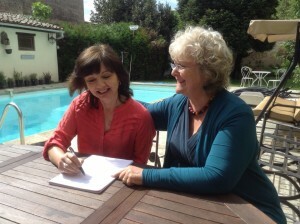 Venue: Chez Castillon, 7 Rue Victor Hugo, 33350 Castillon-la-Bataille, France – see http://www.chez-castillon.com/course/test-writing-course for the 2014 equivalent. Course description: As a precious gift to leave the family, for publication or just to take a joyful trip down memory lane, more and more people are choosing to record the highs and lows of their life experience for future generations to learn from and enjoy. With some memoirs famously becoming bestsellers! Whether you’ve had an inspiring career, a challenging personal life, known great joy or impossible sadness, travelled or met a fascinating cast of characters along the way, everyone has a story to tell. This course will help you evoke your memories, and bring them to life in readable form for your own satisfaction, your relatives’ or – who knows – a much wider audience…. Friday to Sunday: Morning coffee & croissants, Three hour group workshop, Two-course lunch and chat with special farewell lunch and feedback session on Sunday. There will be also be time for individual consultation and advice will be available on self-publication if wished. Sterling price and/or Dinner, Bed & Breakfast rate available on request. For more information on any of these courses, see www.chez-castillon.com.